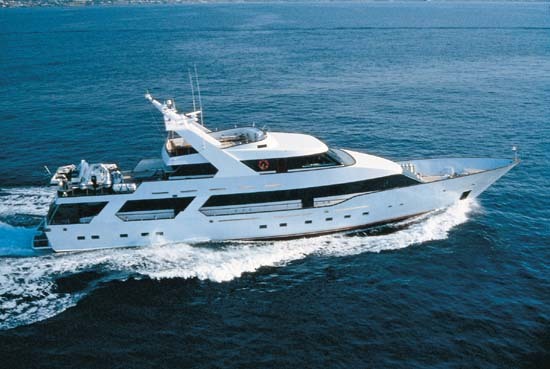 A very luxurious recently upgraded motor yacht, that can host 12/14 guests in 6 cabins, all of which have TV/VCR/Entertainment centers, ensuite facilities and private Jacuzzi. 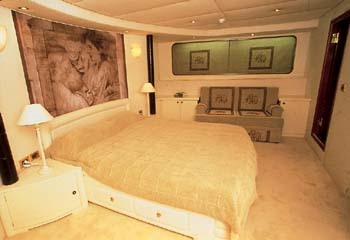 The owner's suite with king size bed, 3 staterooms with queen size beds, 2 staterooms with twin beds and 1 pullman bed each. It is an open sea yacht that will astound the yachtman by the highly sophisticated technology , which includes superior navigation and communication equipment. 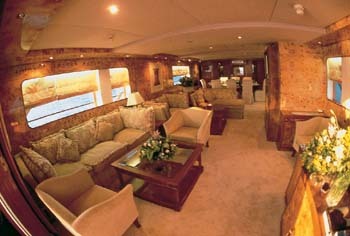 The crew will cater to all your needs. The chef will solicit menu preferences and surprise guests with unique creations. 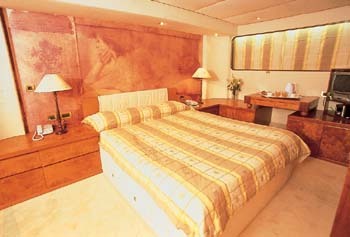 ACCOMMODATION : For 12 guests in 6 cabins. One master cabin with a king size bed on the upper (bridge) deck, three double cabins with queen size beds in the lower deck and two twin cabins each with one pullman berth, also in the lower deck.All cabins, with en suite facilities and private jacuzzi. RECREATION : Speedboat with 90 HP outboard, Waverunner, Zodiac with 40 HP outboard, Water-skis, Windsurfs, Tube/Kneeboard/banana, Snorkeling equipment, fishing gear, TV/VCR/Entertainment centers in the saloon and in all the cabins.